Run Junkie: Runners' Poll: How do you light your way on nighttime runs? Runners' Poll: How do you light your way on nighttime runs? 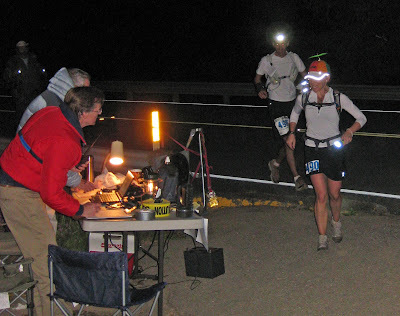 Ultrarunners can get pretty attached to their lighting sources. Pitch black backcountry trails have a way of teaching us very quickly what works and what doesn't. Share your thoughts on how you prefer to light the way on those through-the-night runs and see how you stack up with your compatriots. Really feel strongly about things? Leave a comment about the type of headlamp or flashlight you use and what you love and/or hate about it. Poll Closed. Click for Results. I am using the Black Diamond Icon with a longer cord and waist/pack battery set up. The light is unbelievable, runs all night on full power, although full power is rarely needed. It lights things up really well using the lower power LED setting. After trying lots of other lights, this is definitely the best. I use the Petzl MYO XP on my head on the spot mode, and have a Petzl Tikka XP around my waist in the diffuser mode. Petzl has an adapt kit that allows the Tikka XP to clip and rotate easily on a water belt. Really like this combination. @Luke. I've heard great things about that headlamp. I think AJW had one, or something similar, when he paced me at Wasatch. @Derrick. I love my XP, and it's even the less bright older model. I use it on diffuse and rely on my Fenix flashlight for a spot. Though a handheld can be a pain at times, being able to direct it exactly where I want is something I really like. Black Diamond Spot and Fenix 2LD all day every day, well night but you know what I mean!